As I seem to mention quite frequently, I’m a fairly nosey person, so I love wishlist posts as I love getting to have a peep at what other people are lusting over! So today, I thought i’d share some of my current beauty lusts with you all! Remember a couple of weeks ago I wrote about the BeautyUK lipstick that I love? Well, I want more! This shade is plumlicious and it looks super dreamy! It actually looks similar in colour to the Makeup Revolution Rebel With Cause lipstick(which i’ll be posting a review of next week!). Again, available in Matte or Wet and just £3.49. NARS palette’s always seem to creep their way into my beauty wishlists. They’re just so dreamy! The Yeux Irresistible palette consists of six both warm and deep shades, including All About Eve, Thunderball and Grove. I think these shades are perfect for this time of year to achieve a smoky eye with a warm effect to it! Available online for $48. I recently saw Jemma of DorkFace talking about this palette and ever since, I’ve been seeing it everywhere! That’s certainly a sign that I should buy it, right? This Makeup Revolution Give Them Nightmares palette is only SIX POUNDS, yup, you heardread right! There are 18 shades in this palette and I really can’t wait to get my paws on it and have a play around with all the different looks that you could create with it! My entire nail polish collection is currently in storage back in Gibraltar, so I’m in desperate need of some new shades. These two polishes are perfect for the festive season! The first nail polish is by Models Own from their Diamond Luxe collection in the shade Marquise Maroon. A shimmery maroon shade that I reckon will look lovely on both short and long nails! I’ve also included Rimmel London’s Glitter Bomb nail polish in Disco Diva. Every girl needs at least one glittery top coat and this champagne esk shade will go beautifully with the Model’s Own Marquise Maroon, don’t you think?! I’m not really a massive fan of blusher, but it’s the cooler months that I find myself digging to the bottom of my makeup bag for a good flush of colour to my cheeks. This Gosh shade in Rose Whisper seems like a great staple shade that will suit most skin tones! Available online from Superdrug for £7.99. A couple of weeks ago when I was on the train with Prema, she whacked out one of the MUA Luxe Velvet Lip Lacquer’s and told me that I had to try them out! I tried an MUA lip gloss a couple of years ago and wasn’t overly impressed, but I must admit that these matte lip lacquer’s look really tempting! For this month’s wishlist, I chose the shade Moxie, which is a rich berry shade. At only £3, I might have to grab a couple of different shades and try them out! Last but not least is the Zoella Beauty Soap on a Stick! I’m mainly lusting after this product because the packaging is down right adorable! We’ve all heard of soap on a rope but this soap on a stick idea is pretty cute, huh?! I think this would make a really great stocking filler gift too! Available from Superdrug for £5. 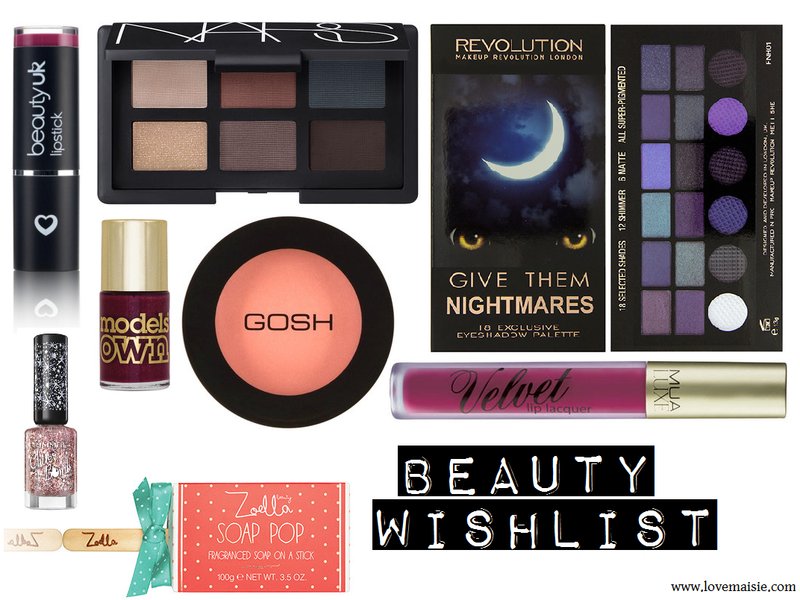 So there we have it, my November beauty wishlist! What are you lusting over this month? Let me know and link me to your November wishlists! I am really curious towards the MUA Luxe Velvet Lip Lacquer, I've seen them in store but I hadn't heard about them!